At our Center, we have been performing Deep Brain Stimulation (DBS) since May 2010. We were the first hospital in Shiga Prefecture to offer this procedure to our patients. DBS is performed using the Leksell stereotactic apparatus. 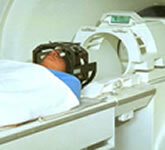 This is the same apparatus used in Gamma Knife surgery, and therefore the treatment plan is also similar. We have performed over 1,000 procedures using this apparatus. 1.What is Deep Brain Stimulation? 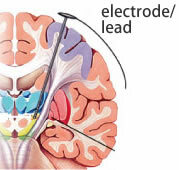 Using stereotactic surgery, an electrode (also called the lead) is placed into the deep region of the brain (figure 1), and the electricity sent through the electrode reduces excessive suppression, rebalances neuronal excitation, and helps to improve symptoms (figure 2). It should be noted that this procedure helps improve the symptoms, but is not a curative treatment of the disease. DBS is suitable when symptoms cannot be controlled with medication or when the patient cannot tolerate the side effects of the medication and its use is no longer appropriate, and when the potential effectiveness of the stimulation appears promising. As the patient’s medication is gradually reduced,the stimulation parameter is reprogrammed each time the medication is adjusted. The various stimulation settings can be adjusted through the skin. The optimal setting will be determined after the surgery. ※The patient turns the pulse generator ON/OFF. →Infection, malfunction such as wire disconnecting, etc. The part (tonsil) of the cerebellum descends causing the obstruction of the flow of the spinal fluid, which causes the fluid to be retained in the spinal cord creating a cavity. The symptoms tend to include neurotrophic pain on the hands and in the lateral region of the abdomen, deformed joints, scoliosis, and muscle atrophy in the hands. 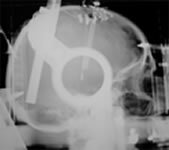 It is often possible to slow the progression of the disease by a procedure called Foramen Magnum Decompression. striatum One of the basal ganglia. Control center for bodily movements. Needs dopamine to function well. 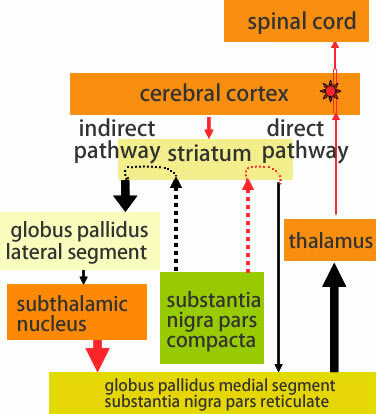 thalamus Transmits signals from the striatum to the cerebral cortex. cerebral cortex Transmits signals from the thalamus to the spinal cord. muscle Moves the body by contracting according to the signals from the nerves. 【Shaking (Tremor)】：Relatively slow tremor at rest - movement resembles rolling a pill on fingertips. Often starts in either right or left hand or leg. 【Muscle stiffness (rigidity)】：Muscles become rigid making it difficult to move smoothly. Bending and extending arms and legs are difficult and when someone else tries to assist in moving the limbs, there is a resistance that feels “jerky.” Difficulty turning the neck. 【Slowness of movement (Akinesia/Bradykinesia)】：Decreased movements. All movements become slow. Difficulty moving the legs forward and walking. Lack of facial expressions, voice becomes quiet and monotonous. 【Postural reflex disorder】：Reflex that prevents one from falling when loss of balance is obstructed. Falling easily, even from a slight push. Inability to stop a fall, even when intending to. →By stimulating the subthalamic nucleus, symptoms improve and the patient is able to reduce the dosage of oral medication. →By improving symptoms during the “off” period (period when a medication’s effect wears off and symptoms increase), the quality of life improves. →When there is a large fluctuation in the symptoms and difficulty in controlling them with oral medication, DBS can reduce the “off” symptoms and maintain a well-controlled period. ※“Wearing off” is a phenomenon where symptoms manifest as the medication effect wears off over time. times when the medication effect appears or disappears regardless of the time of oral medication administration. Post-DBS After starting the stimulation, the dosage of oral medication is reduced, dyskinesia disappears, and the worsening of symptoms during “off” period disappears due to “bottom-lifting effect,” and the patient is able to maintain a mostly well-controlled state. Concerning the rate of complications, while safety and efficacy of the surgery have been established, complications can occur in 1-2% of the cases. 【Cerebral Hemorrhage】：If the hemorrhage is large, there could be subsequent complications. 【Infection】：Localized infection could occur around the implanted foreign objects. If the infection is not well controlled using antibiotics, it may become necessary to remove the implanted electrodes, etc. 【Breakage】：If there is a hardware breakage, surgery may be necessary to replace the component. As for side effects, the patient may experience psychiatric symptoms including hallucinations or worsening of symptoms including temporary dyskinesia. In many cases, these problems can be alleviated by reprogramming the pulse generator. Essential tremor is an involuntary tremor that occurs in any part of the body, but often in hands. Tremor is induced when trying to hold the hand in the air. It also often occurs when one is actively moving. →If the tremor is severe and cannot be adequately controlled through various lifestyle changes and medications, and the patient has difficulty functioning in everyday life, surgery (deep brain stimulation in the thalamus) is indicated. 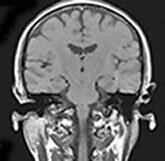 The VIM thalamus nucleus is targeted for stimulation. Tremor often reduces immediately after the stimulation begins. Given that essential tremor is generally slower to progress compared to Parkinson’s Disease, long-term positive outcome of the stimulation therapy can be expected. Other than side effects that accompany general stimulation therapy, dysesthesia and articulation disorders can occur, but they can be reduced through adjustments. Mild tremor is more common (20 times more common than Parkinson’s Disease), and is slower to progress.